immunity without the harsh chemicals that can harm you and your family. Internally - add 2 to 3 drops daily in morning coffee, orange juice, or water. High quality large 2-ounce glass amber colored bottle with F72 stamped bottom. It includes a black screw cap with a spray nozzle. You'll appreciate the quality threading between the glass and the cap and how smoothly it screws on. 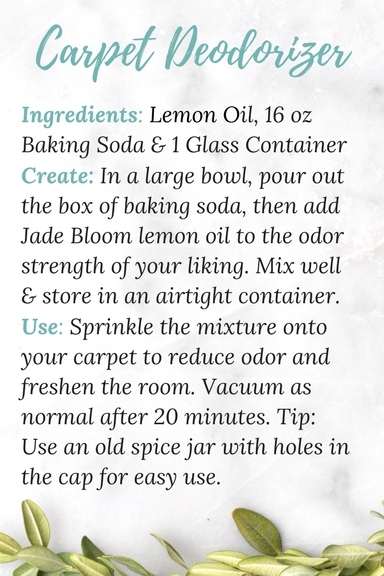 Create: In a large bowl, add the box of baking soda, then add Jade Bloom lemon oil to the odor strength of your liking. Mix well and store in an airtight container. Use: Sprinkle the mixture onto your carpet to reduce odor and freshen the room. Vacuum as normal after 20 minutes. Tip: Use an old spice jar with holes in the cap for easy use. Create: In a glass spray bottle, add 25 drops of CLEANSE or PROTECT, then fill the bottle with water. Shake well as water and oil do not mix well and will separate. Use: Shake well before each use and spray onto counter tops to disinfect, or into the air as a natural room spray to purify and deodorize the room. You will love being able to use essential oils for carpet cleaning! Love all three!! Cleanse smells great, I love for cleaning & diffusing. Protect is a go to for me I have resently stated using it on my toothbrush once a day! (My teeth feel so clean!) Lemon is great for so many things I love the fresh smell! Jade Bloom I'm so glad I found you! Absolutely love this kit. The smell is amazing and there is not better feeling than knowing everything is clean when I use it is an added bonus! Bye bye chemical wipes for cleaning! This set is wonderful for cleaning and disinfecting! If you are trying to avoid chemicals, this is a MUST!!! 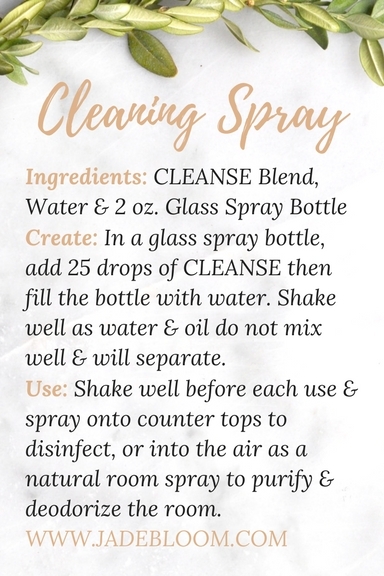 I diffuse Cleanse all the time,have had it 4 quite a while now.Use it with the recipe to now to clean and disinfect everything! With all the germs around a great way to "Protect"
I use cleanse any time I want to clean and disinfect anything. I spray on my hands after being in public places and especially when around sick people. I do the same with protect. I used to get sick any time I was near someone who was sick. I would not only get what they had, it always came with a chronic cough. After research and learning about JB oils, I can be around anyone who is sick and no more chronic cough. Doctors could never really cure my cough. I always had it, but many ER visits with the chronic cough. I can't thank JB enough for all the things they have helped me with as well as others. I use this instead of other air fresheners now. It makes the room smell clean and it gets rid of all the odors that I am trying to mask. I love this kit!! I can't get enough of it!!! I can't get enough of this!! Great kit!!! Jade Bloom has high quality oils at great prices! This gives you a great way to experiment with essential oils....and their health benefits! Love everything! I love Jade Bloom. Their kits are fun to make and they're a great value.